ESS Shakuhachi Forum :: Binding? Posted: 2011-06-19, 13:17 Post subject: Binding? I have a flute that needs binding. I want to try and do it myself. I have been looking at some nice colorful nylon, but I want to keep it natural. What type of natural bindings are there and where do I get them? What did they use before plastics and synthetics? Posted: 2011-06-19, 14:03 Post subject: Binding? They used rattan. That's why the flutes were always cracking. Posted: 2011-06-19, 15:22 Post subject: Binding? Where do I get rattan anyway? Online? Posted: 2011-06-19, 15:41 Post subject: Binding? put the inlaid nylon binding under the inlaid rattan binding. Posted: 2011-06-19, 15:46 Post subject: Binding? It can't be inlaid. Its all topical. I just need a source of where to get it. Posted: 2011-06-19, 21:14 Post subject: Binding? the rattan that is used most of the times for bindings is 2 rin rattan (0.6 mm). its not cheap. i was able to get a 4 rin rattan (1.2mm) from a local basket weaver for free, you can also buy it cheap im sure. rattan is the material usually used for weaving. Any way another simpler option is getting a synthetic strong thread in a color you like or a mono-filament (fishing line). a very good thread with many colors is called eurotool tuff cord. Posted: 2011-06-20, 06:27 Post subject: Binding? I can get .75mm (slightly larger than 2 rin) rattan at a local fishing shop. 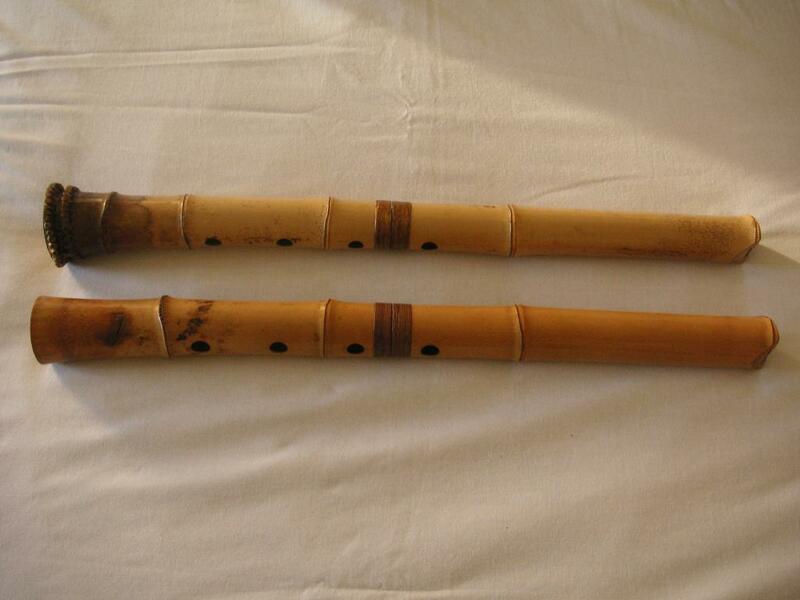 To do the nakatsugi of a shakuhachi would cost around 2000 yen (a little over $20 US). Shipping would cost another $5 - $10. If you're interested, I'd be happy to help you out. Posted: 2011-06-20, 08:17 Post subject: Binding? If you want decorative bindings rattan is OK but if you want something to hold the flute together and stop it from cracking you're better off with nylon. Posted: 2011-07-05, 05:26 Post subject: Binding? I just bound a new shak with nylon Tuff Cord. I used a size 7 which only comes in black or white, but they have size 5 or smaller in a whole bunch of colors. To be honest, the size 7 was a little tough to work with. My thumbs were sore for 2 days afterwards from keeping pressure on the first and last couple passes of each binding. If I remember correctly, Office Depot carries little rubber thumb condoms for people who sort papers all day. I think it may be worth trying those out to help get a better grip on the nylon cord. Posted: 2011-07-16, 22:08 Post subject: Binding? Brian, what is your preferable style of bindings? inlaid rattan? Mono-filament? nylon cord with urushi? Posted: 2011-07-17, 01:13 Post subject: Rattan is crap. There are so many kinds of binding..................and it depends whether you are creating new binding or if you are replacing old. Because for example if there is already a groove cut into the wood it's not your decision whether to destroy the nobe integrity. Let's say it is a brand new piece of bamboo and you just want to protect it from cracking with precautionary bindings. Then I would prefer external nylon bindings. And I do like urushi paint over it. I don't tend to cut into the wood. Some people say it changes the tone although I must admit in cases where I've had to because of cracking, I did not notice that it changed the tone. Rattan is crap. It has a tendency to come undone, fray etc. I also don't think it looks good, really can't understand why people are so hypnotized by it. So in the case of a flute with rattan binding that needs to be replaced, I like to have the rattan removed, the underlying nylon or whatever replaced with new nylon and then ideally either cherry or some other wood, or just multiple coats of urushi. Here's my Miura Kindo with cherry wood bindings by Kiyoshi Kudo. It's second from left. Perry Yung did something similar for me on the nakasuge of a 1.6 Momose Hodo which needed bindings replaced. I forget what wood it is. It's the one on top. Here's a good example of nylon bindings painted over with urushi because the flute was cracked to smithereens and really needed some help. This is a very practical method. 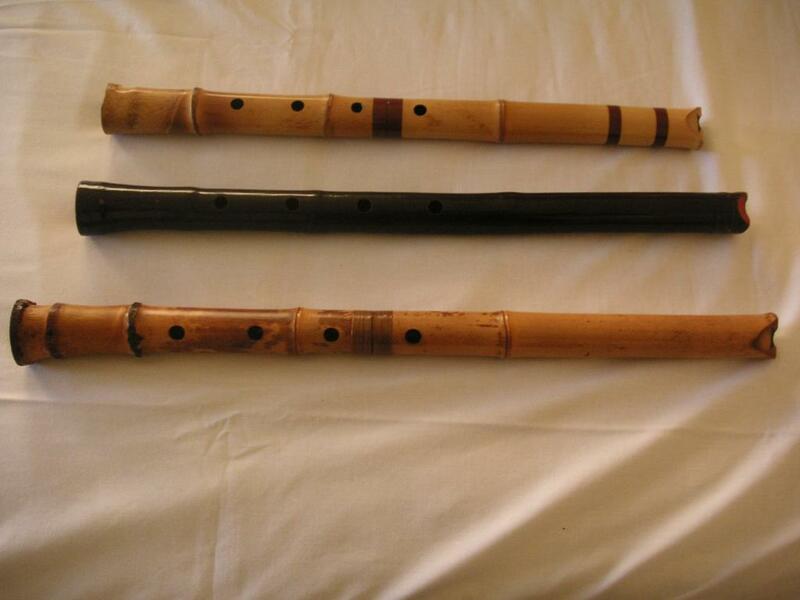 The flute is a 2.3 Taimu called Frankenschwantz. If you look at the 1.7 at the top of this pic you can see a very refined version of nylon covered with urushi. This is very nice but it can chip. Still, much more stable than rattan. As far as I'm concerned these are all better solutions than rattan. Rattan is an example of tradition being followed past its used-by date. Posted: 2011-07-17, 01:29 Post subject: Binding? so if one of your flutes gets cracked, you tend to ask for an inlaid or non inlaid binding? I found out so far that other then for looks, you can have a very thin mono-filament uniform bindings that does not interfere with playing very much even if the whole flute is bound. cant see much from the picture but using tree barks as a replacement for rattan in inlaid binding seems like a nice idea, and more economical wise also (since rattan string prices are sky high). 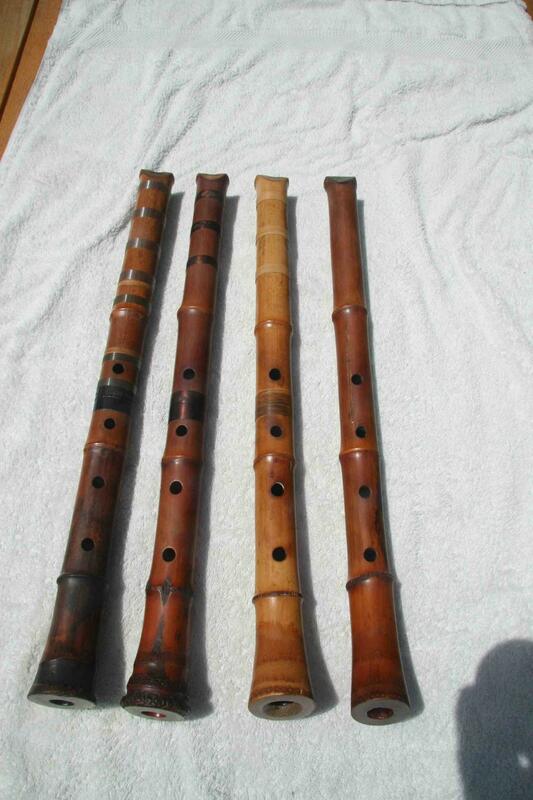 Im binding few flutes right now and im just thinking about some of them which im not sure what should i do. Posted: 2011-07-17, 01:43 Post subject: Binding? Usually non-inlaid, but even if they are inlaid I don't ask for rattan because the repairmen I work with tell me it's strictly ornamental and serves no practical purpose. And I don't like the way it looks either. Posted: 2011-07-17, 08:45 Post subject: Binding? Not to confuse things, but just to offer a different opinion. I will choose inlaid rattan or urushi covered filiment over any other method. Here are a couple of photos of my Kyomudo 1.8 that burst open in many places 21 years ago. The repair was done by Kyomudo sensei at that time with inlaid rattan and it hasn't budged in all that time. The thing that I like about inlaid binding is that the inlay protects the outside edges of the rattan from wear, and depending on where the binding is, it doesn't create a grip irregularity. Posted: 2011-07-17, 11:11 Post subject: Binding? Inlaid bindings are nice........people say it changes the sound but I don't agree. People have to also consider the price of the various repairs. 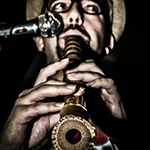 In the case of a serious flute like my Kindo I did not spare any expense. And the cherry was over inlaid bindings. For many of the more inexpensive instruments inlaid rattan bindings like yours would be more expensive than the flutes themselves if you got it done in Japan or even from the Western guys. It also depends whether the instrument needs bindings as a repair measure as in your case or if it it precautionary. I always spend less on precautionary bindings than on the ones for cracked flutes, because some flutes never crack. Nice looking flute! I hope I can try it sometime. Posted: Today at 20:38 Post subject: Binding?